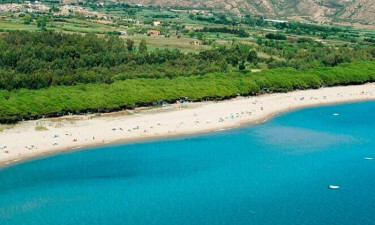 Situated right on the ocean on the enchanting island of Sardinia, Camping Iscrixedda offers guests a camping holiday that the whole family will never forget. This luxury camping site is situated on the edge of the large and lovely Gennargentu National Park and is just waiting to be explored by nature lovers, while the impressive city of Cagliari is located less than a 2-hour drive away and makes the perfect day trip destination. Interested? Contact our Lux-Camp representatives to learn more. Why Should I Camp at Iscrixedda? Evening entertainment for all the family. Natural and man-made attractions nearby. A stunning sandy beach is located just 100 metres from this leading Lux-Camp and this is the perfect place to soak up the sun, as well as take part in aquatic activities, such as windsurfing, kayaking and swimming. There is also a large indoor play area where the kids can let off a little steam, and a special kids’ club that boasts activities for children of all ages, managed by the dedicated entertainment staff. No luxury camping experience would be complete without indulging the senses in the evening, and this is the perfect place to sample fresh fish and meat dishes that are prepared in the traditional Sardinian style. There is also a nearby pizzeria where guests can grab a slice of pizza while unwinding at the bar. Guests will also be able to prepare picnic lunches to eat on the beach in their spacious mobile home, using fresh bread, famous Sicilian meats and cheeses that can be found in the on-site shop.